The focus this summer has been tables, lots of them – an elegant glass topped dining room table with 6 sea horses mounted on a polished ebony base; the Giant Mussel coffee table installed on a huge yacht as well as the Alaska King Crab coffee table. The Giant Mussel Table was a particular challenge as the tempered glass had to be fitted in such a way that it can withstand the ups and downs of sea life on a large moving boat. 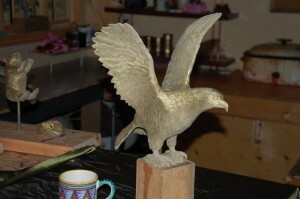 There is also a new Eagle Sculpture and a Raven Sculpture that will be show cased in my next update. Currently I am working on a new life-sized Wolf Sculpture, a more playful pose, and plan to have this cast in bronze for the spring of 2018. This fall I hope to have a couple of entries accepted into the Sidney Fine Art Show running from October 13 to 15th and I will be participating in my 10th annual Fall Studio Tour on October 21 and 22. The spring and summer have been busy with three new coffee table commissions. One of a new version of the Giant Octopus Table, a second custom design using a s slap of polished maple burl supported by octopus tentacles and a third featuring a school of three Chinook salmon. My latest piece is the Crouching Octopus shown below. This piece depicts one of my favourite poses that I have observed during my diving adventures. The sculpture is approximately 16 inches high, and 18 inches in diameter around the base and weighs 65 pounds. I think the piece conveys a very strong sense of movement and it certainly was a very enjoyable piece to create. The sculpture is being done as Limited Edition of 25 and Editions 1 and 2 have been sold. Crouching Octopus is now on display at the Shell Aero Centre at the Victoria International Airport and will also be shown in Sidney Fine Art Show between October 14th and 16th. Other new works completed this summer include a pair of Sandhill Cranes inspired by last summers’ visit down into Idaho as well as a new Tortoise, a little hedge hog, a racoon and a Raven, a pair of Sawhet Owls and a Chinook salmon mounted on a cobble base, These pieces will be featured in upcoming my winter blog update. If you are in Victoria this month, please come out to my studio tour on October 22 and 23 Saturday and Sunday 10 to 5 each day. We will a large display of new bronzes and works in progress as well as refreshments. Other events this month include the Sidney Fine Art Show running between October 14, 15 and 16 at the Mary Winspear Centre in Sidney. If you are interested in a free pass to the show please contact me. A day in the Life..... I love being an artist and it is immensely rewarding to walk down the path from our house, third cup of coffee in hand, settle into my studio each day and start creating a new sculpture. The studio is warm and inviting and full of inspirational images and keepsakes; it is a very peaceful and comfortable place to work. When I am in the midst of creating a new sculpture I will often work for 10 to 12 hours a day taking frequent breaks along the way to walk in the garden and stretch my muscles, as the sculpting requires some very intense focus and concentration and can be quite exhausting. This is all balanced out by the extremely gratifying sense of achievement and satisfaction when that clay shape and texture comes to life and you know that you have created something with lasting appeal. Of course this doesn’t happen every day as in between the start of each new sculpture there are a lot of technical processes and details and grunt work that need to be tended to. The mold-making process for each sculpture will typically consume one to two weeks time working with a messy array of rubber, metal, plaster and fibreglass, cutting, mixing, trimming and drilling. After the mold is done, we need to make a wax replica of the original sculpture making sure it matches all the detail of the original sculpture and then get the wax replica ready for delivery to the foundry. With the wax replica done and delivered to the foundry, it is inevitably time to regroup, clean and organize the studio and get started on, or back to, the next project. In between the creative and technical processes out in the studio, there is a lot of business to tend to and this typically takes some dedicated effort each day – lots of planning and strategizing. Client correspondence, upcoming art shows and displays, inventory management, arranging studio supplies, on-line and print media advertising, project quotes, website development, social media work (a recent undertaking), cash flow and financial management and on a really good day, scheduling a studio tour for clients, or building a shipping crate for a sold sculpture! The technical tasks and many artisan skill-sets required at the foundry are a whole other story which I will describe in a subsequent post. New Works in Progress: This is an in-progress snapshotof my latest creation, a pair of Sandhill Cranes which I expect to have cast in bronze by May of this year. These pieces were inspired by a longstanding fascination with these incredible migratory birds and more recently by some fortuitous observations made last summer during a road trip through Northern Idaho. 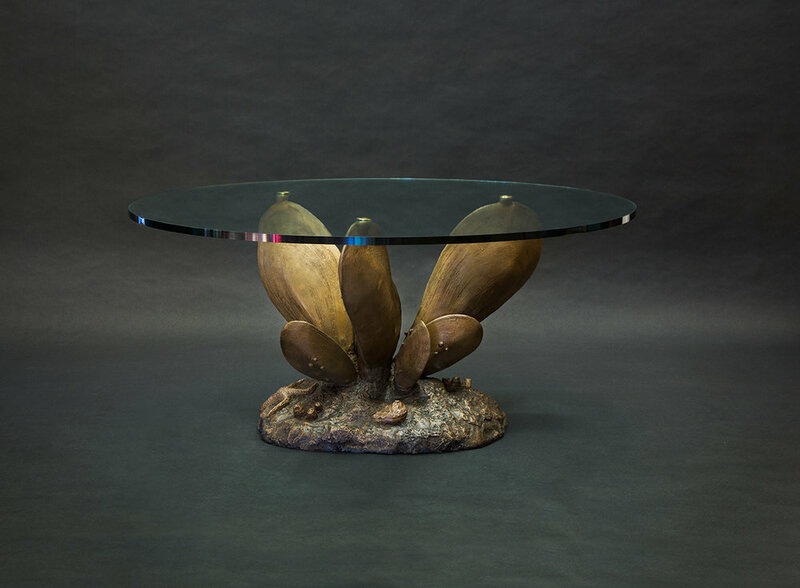 Other new works that will be posted on the Website this spring include a new custom designed coffee table commission that incorporates a heart-shaped piece of maple burl supported by three giant bronze octopus legs with a small feature octopus suspended under glass. There is a also a new sculpture of a standing Grizzly bear, a sculpture that was inspired by a close encounter last summer while exploring Desolation Sound. Someday I hope to be able to create a life-sized version of this piece. A Note to Potential Clients: There has never been a better time to consider purchasing a bronze sculpture from a Canadian Artist such as myself. With the discounted Canadian Dollar I am able to price my sculptures at a significant discount for USA purchases. For Corporate Canadian clients, I have some very interesting information on CRA tax treatmentsfor Art work produced by Canadian artists. I am very excited to introduce my involvement in the Priya’s Shakti project created by Ram Devineni. Mr. Devineni is a New York based filmmaker/producer and founder of Rattapallax. Mr. Devineni has created a comic book superhero, Priya, and is in the midst of a global campaign raising awareness about women’s empowerment issues and gender-based violence. The genesis of the story is in India and the signature image of the campaign and comic book series is of a young village girl, Priya, riding a Bengal Tiger (her Shakti, or source of empowerment). My involvement in the project started after hearing an interview with Ram on CBC Radio. I was very moved by the story and the Priya campaign. I contacted Ram and suggested that a bronze statue of the campaign’s signature image – Priya sitting on the Bengal Tiger - would serve as a very permanent tribute to the Priya Movement and help to keep the level of awareness around gender based violence high. A new project was born. The first phase of my involvement in the project was to create a 1/3 sized bronze maquette of Priya’s Shakti. In preparing to undertake the sculpture work I started searching for imagery of Bengal Tigers and stumbled across the Lions Gate Sanctuary in Colorado that provides a home to eight beautiful tigers. I contact the owner explaining the nature of the project and asked for detailed measurements and photographs of Bengal Tigers to assist with the project. Coincidentally it turns out that the owner of the sanctuary, Dr. Joan Laub, is an old high school friend of mine from 1972 who has now devoted her live to the animal sanctuary and tigers, as well as her professional practice running a Trauma Centre for sexually abused women. Serendipitous connections. The first phase of the sculpture project is now complete and the bronze maquette will be displayed in an exciting interactive show with works by multiple artists focusing on the Priya movement at the City Lore Gallery in New York City opening May 7th and running for three months. The next phase of the sculpture project will be to finalize details of the installation site, raise project funds and then start on the life-sized sculpture. More octopuses have been the theme this winter. The Giant Octopus Table created last year is nearly sold out now with one edition left. Four of the tables went to Octopus Investments in the UK. A new Octopus in Motion sculpture, commissioned by a local client, is almost complete and photos will be posted in March 2015. The Howling Wolf sculpture is being cast in bronze and will be installed next month with photos to follow. Other new creations this winter include a smaller version of the Black Tipped Reef Shark mounted on a piece of simulated coral, a Shark Coffee Table and a burrowing owl. It was ten years ago this month when I gave up my day job as a consulting biologist and decided to become a full time artist, creating all the creatures that I had grown to love. It was time to commit and move from a sculpting hobby to a serious undertaking that would consume most of my waking hours. We moved out into the country and built a beautiful studio in the forest behind our home. It was a family affair. Shortly after there was a very exciting call from the Royal BC Museum who wanted to commission me to create a life size Woolly Mammoth and a massive collection of other bronze animals celebrating BC’s rich and diverse natural history. I was excited and hooked, and I didn’t sleep for months. In the end the money never quite materialized and that fanciful dream slid by. However, with the new found confidence and enthusiasm I started creating more and more sculptures and building a wonderful network of clients and supporters. Soon it became very busy and my wife, Jutta, started helping out in the studio making the molds and preparing the wax replicas of the sculptures. Looking back I realize how lucky I am and that in my mind I have the best possible job in a most amazing, peaceful and inspirational setting. Often times I will see or hear some beautiful animal nearby the studio - Owls, Deer, Raccoons, Eagles, Ravens, Osprey, Lizards, Frogs and even the occasional Cougar. Working with the animals and the people I love, and meeting all sorts of interesting clients from around the world we have produced over 170 unique sculptures in the past 10 years and they are in homes and business far and wide. I like the fact that what I create will endure. There is hardly a week that goes by without some passionate inspiration that comes to mind, the start of my next project. Sometimes they steep for months or years, but eventually they will come to fruition. This past year has been one of the best and the coming year has the glow of even more creative undertakings. To coin a phrase from my good friend Bryan, a worldly adventurer, I plan to keep doing this until the wheels fall off. Thank you for your interest. Stay tuned…. This summer I had the good fortune to be able to go on an incredible wilderness camping trip up into Desolation Sound where we saw an amazing array of west coast wildlife. There was a very special encounter with a group of three Coastal Wolves that came through our camp and serenaded us all evening with their howls and yaps on a rocky bluff on West Redonda Island. It was a spectacular sight and I felt very inspired. I also learned of the relationship between coastal wolves and ravens and how the raven will alert the wolves to the presence of prey and they in turn benefit from the fruits of the wolves’ efforts. It didn’t take long, sitting around the camp to decide that wolves and ravens would be my next sculptural subject. I am now working on a howling wolf sculpture and a series of ravens in various expressive poses. Coincidentally, I also received a commission to do a howling wolf sculpture the next day, and in another strange sequence of events, we met the former Director of Wolf Research and the Re-introduction Program for Washington State while sharing our wolf stories at the Refuge Cove Marina. Other projects underway include commissioned works for two Golden Retrievers, a smaller Black Tipped Reef Shark sculpture and a pair of African Elephants (1/8th scale). A new octopus table design and an octopus fountain are also starting to take shape. This fall I will be entering two new sculptures into the Sidney Fine Art Show and participating in the Saanich Peninsula Studio Tour, both in late October. The winter slipped by with a flurry of activity in the studio creating a series of large (and heavy!) ornate bronze swimming pool ladders and step rails for the California design company I am working with and their mysterious European clients. At the same time we were working on a new Black Tipped Reef Shark that has just been completed and is now on display out at the Shell Aero Centre at the Victoria International Airport. I am very excited about this sculpture as it has a large presence (5 ½ feet long) and conveys a real sense of gracefulness as the shark glides over the coral head. The Giant Octopus coffee table created last fall has been a big hit and we are currently fabricating Editions, 2, 3 4 and 5, three of which are going to a client in London UK this summer. There are a lot of tentacles around the studio these days. With a new summer season coming we have reinvigorated the sculpture displays at the Shell Aero Centre at the Victoria International Airport as well as the display pieces at Nimmo Bay Wilderness Resort. New projects coming up this summer include a custom designed garden fountain, a new version of “Board Dog” (English Bull Dog on a skate board), a small fox sculpture, a small version of the reef shark, a cast Narwhal Tusk mounted on a rock base and yet another octopus pose and coffee table design. All of my foundry work is now undertaken at South Island Bronze Works in central Saanich under the skilful eye of fellow sculptor Nathan Scott. This has allowed me to increase my annual capacity and shorten turn around times for custom commissions. Once again I will be participating in the Saanich Peninsula Spring Studio Tour (June 7 and 8th) and hope to be able to submit entries to both the Sooke and Sidney Fine Art Shows this summer and fall. Thanks for your interest and support and please check back soon as I plan to post more frequent updates over the coming months. The Black Tipped Reef Shark sculpture is now finished and the casting process has begun. I expect to have this piece completed in bronze in February 2014. This piece is close to 6 feet long. The photograph shows the completed sculpture in painted clay with some of the mold divide shims in place. This piece is mounted on a cluster of staghorn coral branches. Soon I will start on a smaller version of this sculpture which will be available in the Spring of 2014. I am also casting Ella, a very large English Mastiff Cross, that was privately commissioned. Ella will be on display for a few weeks at the Pier Hotel in Sidney during January before&nbsp;she is installed at her home. Continuing on from last year's commissions for a design firm in Los Angeles, I am now working on some custom swimming pool & ladders and rails with a mythical fish theme for their client in Russia. Other sculptural projects that are on the burner and will start to come to life this spring include a life-sized beaver and a life-sized Pacific White-Sided Dolphin. Thanks for your interest and support during the past year. Looking forward to an exciting and creative New Year in 2014. Happy New Year to you all. October 2013 New Works in Progress I am very pleased to announce that both of my entries into this year’s Sidney Fine Arts Show, the “Giant Octopus Table” and “Languid Cougar” received Juror’s Choice Awards. There were over 400 artists and 2000 entries submitted to this year’s show. I am already planning my submissions for next year when I plan to enter both the Sidney and Sooke Fine Art Shows during the summer and fall of 2014. We are now getting ready for the Fall Studio Tour October 26 and 27. I will have lots of completed bronzes – small and large – as well as works in progress on display, demonstrations and there will be a welcoming assortment of refreshments and snacks. If you are in the area …. (see map in Contact section). A new sculpture of a Black Tipped Reef Shark that is underway in the studio. This piece will be mounted on a sculpted piece of staghorn coral. The shark is 1.5 m long and stands 65 cm high. This piece was inspired by my young daughter who is passionate about sharks and their preservation. I expect to have this piece cast in bronze by Christmas. New photos and a refreshed web design are coming soon. The summer lull is over and I am now working on a number of new sculptures including an Egret, a new and smaller version of the Swimming Octopus that is being done for Octopus Investments in London UK and Ella, a beautiful, full of character and very large Mastiff Cross. Some other projects on the go are a new bear sculpture, a small muskox and a White Tipped Reef shark which I hope to have completed later this fall. I have two new sculptures on display at the Shell Aero Centre at the Victoria International Airport this summer including the giant octopus coffee table and a life-sized mountain lion. Both of these pieces will be entered into the Sidney Fine Art show this fall. If you are in Sidney this summer be sure to visit the Sidney Sculpture Walk that includes 13 new works by local artists including my entry of the “Board Dog”. My winter was particularly busy this year as I was commissioned to create a number of unique specialty items for a client furnishing a large villa in Russia. These creations included a large ornate chandelier weighing close to 180 pounds, a staghorn coral dining room table, a series of wall sconce lamps and vanity sinks in the form of giant clam shells, an elaborate bronze towel rack and custom door hardware. A total of 73 bronze pieces, small and large, were made over the past four months. With the Villa Project now complete I am refocusing on projects like the giant octopus table that were started last fall and a new coffee table with sea turtles mounted on a beautiful piece of weathered driftwood. I am also working on a series of new projects including a small Grizzly Bear, Muskox and Walrus sculptures with plans to create a life-sized Blue Shark sculpture over the summer months. 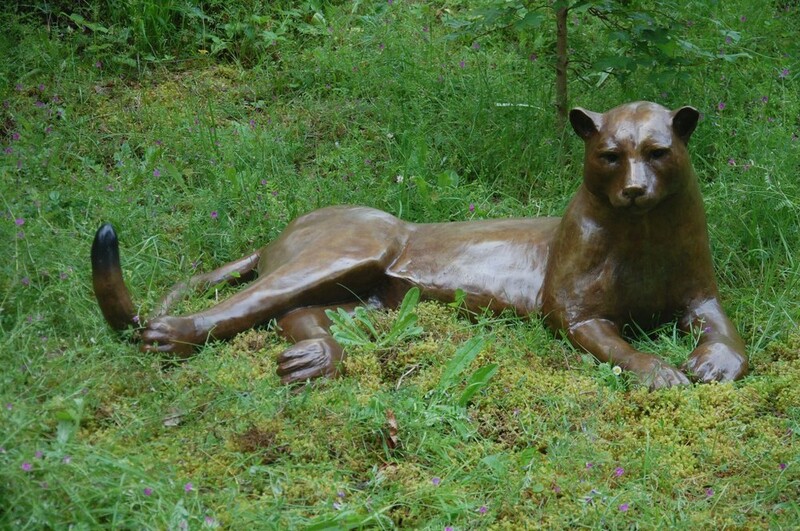 I have just completed a life-sized sculpture of a cougar that will be cast in bronze during April. Once again the studio will be part of this year’s Saanich Peninsula Studio Tour on June 8 and 9. If you are in the area drop by during the tour and take a look at the new projects underway as well as my collection of completed bronzes in the garden gallery. Selected pieces will also on display throughout the year at Haro’s Restaurant in the Pier Hotel in Sidney and at the Shell Aero Centre reception area at the Victoria International Airport. This photograph shows my new cougar sculpture under construction in clay. After a successful fall show in October I am settling into my studio and working on a number of new commissions. The first project I have embarked on is a dining room pedestal table that emulates a cluster of Stag Horn Coral. This is an exclusive piece that was commissioned by a client in Los Angeles. Continuing with the table theme I am in the final stages of completing a new giant octopus sculpture that supports either a round or square coffee table top. The coffee table is expected to be completed by early January and will be on display at the Shell Aero Centre at the Victoria International Airport. I am also working on a life-size sculpture of a mountain lion that is posed in a lying position with a slight flick to the tail. This piece will be cast in bronze this December. This winter I will be sculpting a commissioned life sized White Sided Dolphin that will be installed at the entrance to the Nimmo Bay Wilderness Resort. My next scheduled show is on April 6 and 7th at the Pacific Brant Carving and Art Show in Sidney BC. Followed by the Saanich Peninisula Studio Tour on June 9 and 10th. Visitors to the studio are always welcome, just phone in advance to make arrangements. 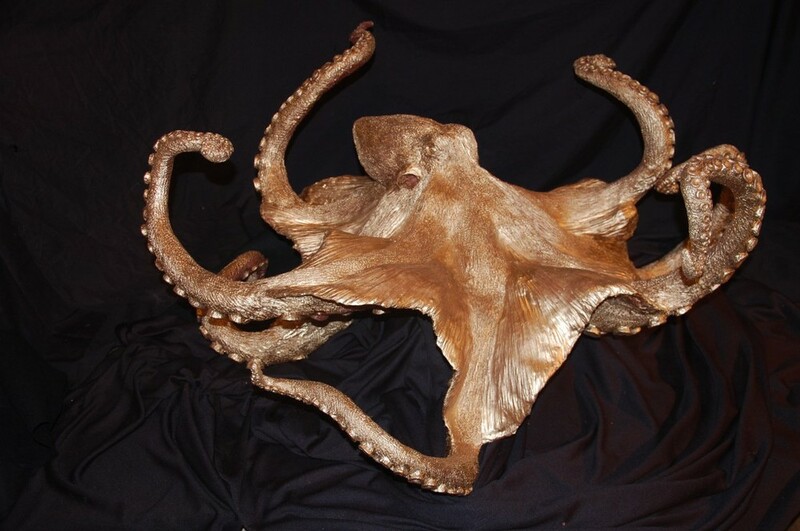 The recently completed Pacific Octopus sculpture shown above is 13 x 10 x 3 inches and is the first in an Edition of 25. 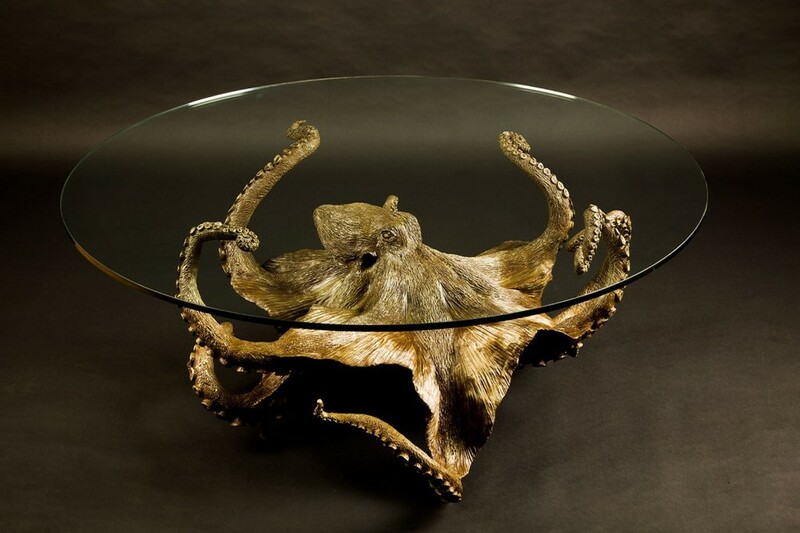 The Giant Octopus designed as a coffee table is shown below in painted wax. The Sidney Fine Art Show is quickly coming up. October 14, 15 and 16th at the Mary Winspear Centre. This year I have three entires in the show; Timber Wolf; Comforts of Home and the Great Blue Heron sculpture. This is a picture of the White Sturgeon Sculpture that was commissioned by the Shaw Ocean Marine Centre in Sidney BC. The bronze sculpture is 6 feet long and it has been mounted on a piece of maple driftwood. The sculpture will be used as part of the Centres’ public education program bringing attention to this mysterious and ancient fish that plies the waters of the Salish Sea and the Fraser River. The sculpture will be on permanent display in the main atrium of the Shaw Ocean Marine Centre. The sculpture was created as an Edition of 3. My next major project that I plan to have completed by late October is a new Octopus Sculpture designed as a coffee table support. This piece will be on display at the Pier Hotel in Sidney in November and then at the Shell Aero Centre at the Victoria International Airport. I will be participating in the Fall Studio Tour organized by the Saanich Peninsula Community Arts Council this October 20 and 21. My studio will be open from 10 am to 5 pm on Saturday and Sunday. There will be a large selection of completed bronze works on display as well a s number of new works in progress. Refreshments will be served. My sculpture of a British Bulldog riding a skateboard – “Board Dog” – has now been installed along the Sidney Art Walk in Sidney BC. Check the Art Walk next time you are in Sidney, there are some great sculptures on display. Twelve artists were selected by the Town of Sidney for the first phase of the Art Walk Project. All works displayed are available for purchase. This is a picture of my entry into the 2012 Kingsbrae Garden Sculpture Competition in St Andrews New Brunswick. The sculpture garden show opens on June 14. Toadstool was inspired by my love of the spring and the fall seasons. The spring chorus of frogs and the arrival of fall mushrooms are touchstones for me and I wanted to celebrate these events in a sculpture. I also wanted to create something that was fun, a little whimsical and magical, and perhaps able to bring a smile to a garden visitor. The sculpture was done as an Edition of 3. The bronze sculpture weighs approximately 280 pounds. The Spring Tour is on Saturday and Sunday June 9th and 10th. My studio will be open from 10:00 am to 5:00 pm each day. Come for cookies and a beverage and see the latest projects as works in progress: Grizzly Bear – New Coffee Tables – New Octopus Table – “Boarddog” (Bulldog skateboarder) and a large White Sturgeon Sculpture that will be going into the Shaw Ocean Marine Centre in Sidney this summer. There will also be a large collection of completed bronzes on display. I am very excited about this project which is nearing completion. Another octopus sculpture, and once again I have it fashioned as a coffee table. This is my 7th octopus sculpture and each time they evolve as I discover more about the creatures and the technical aspects required in molding and creating these sculptures. This sculpture was inspired by some images we captured last summer during a halibut fishing trip while up at Nimmo Bay Resort. We didn’t catch any halibut, but we did catch a magnificent octopus and when we released it floated through the crystal clear water column as it descended back to the depths. It was amazing. The image left a vivid impression with me and I have been working on this piece over the winter. I have constructed this one using a new method where the sucker detail is cast separately and then added to the body of the octopus during the wax casting stage. This has allowed me to capture a far greater level of detail in the suckers. And for those of you who are wondering, there are a total of 780 suckers on my sculpture. The table design is such that the supporting sculpture base can be reversed with the suckers facing up and the head down or the other way around – two tables in one. This will be a very unique and distinctive piece. The glass table top can be cut as an oval or square and can be etched with a marine pattern selected in concert with the clients desires. I expect to have it finished and on display at the Shell Aero Centre at the Victoria International Airport in June 2012. With a recent commission for a unique coffee table, we have spend lots of time beach combing these days looking for interesting pieces of weathered drift wood that can be fashioned into table pedestals. A pair of bronze steelhead trout will be mounted into the wooden pedestals on each table and they will be finished off with an etched maple leaf pattern on the glass tops. This year I am displaying one of my new sculptures of the Northern Pike at Selwyn Lodge in Northern Saskatchewan. I am also creating a new bronze sculpture of a walleye that I hope to have completed by the fall of this year. This year I will be displaying several new works in each of the guest accommodations rooms at Nimmo Bay Wilderness Resort. The giant mushroom with a sitting toad – Toad stool – is almost ready for shipping out to the Kingsbrae Garden Sculpture competition with an opening event on June 16. We are hoping it will be well received as it is a long costly way for shipping. Check out Kingsbrae Botanical Gardens at www.kingsbrae.com. I will once again be participating in the Saanich Penninsula Arts Council Spring Studio Tour on June 9 and 10th. There will be demonstrations on sculpting and mold making as well as a large display of new bronze works and several in progress projects. Refreshments and cookies will be served. Throughout the summer selected pieces will also be on display at the Shell Aero Centre at Victoria International Airport and The Pier Hotel lobby in Sidney BC. On a personal note we have some made some changes around the house and studio this year. My wife Jutta has folded up her gardening business to focus on our newly expanded family and work in the studio doing much of the mold making and wax casting work as well as helping out with shows and marketing. We also did our first a joint sculpture project creating the giant mushroom sculpture last year. Our “Christmas Inspired Art Show” at the Muse Winery had a very enthusiastic turnout this year and all of the participating artists were very appreciative of the responses. We are planning an even bigger show next December! Thanks to all who came out. One of my clients who purchased the Great Blue Heron Sculpture during the Sidney Fine Art Show in October has won luxurious accommodation, dining and adventure at Nimmo Bay Resort for 3 days during the summer of 2012. I am thrilled to announce that my entry in the 4th Annual Kingsbrae Garden sculpture competition in St. Andrews, New Brunswick, has been selected as one of finalists for 2012. ‘Toadstool’ will consist of a giant mushroom with a very large frog sitting under the shelter of the mushroom cap. It is going to whimsical, very fun and it looks like there will be a big road trip coming up this summer. Other projects now underway include a new 1/3 sized open wing Eagle Sculpture commissioned by the BC Government Employees Union for their upcoming Award of Excellence ceremonies, a new Octopus in Motion sculpture, a British Bull Dog – “Oliver” riding a skateboard, a pair of spawning steelehad trout, and for some contrast, a stylized female figurative piece. Looking forward to a creative New Year. Thanks for your interest and support this past year. Several events are planned for this fall. First there is the Sidney Fine Art show where I hope to be exhibiting up to three new sculptures (October 14, 15 and 16th) followed by the North Sidney Studio Tour (October 22 and 23). There will be a fine selection of wine and snacks served during the studio tour with lots of bronze sculptures just back from the foundry as well as numerous new works in progress. Drop by and see what is new – bring your ideas as I would love to take on some new projects. I will be participating in a group show and sale at the Muse Winery in Deep Cove (North Saanich, BC) on December 9, 10 and 11. Always an exciting event with a rich collection of unique art works by 6 different artists and a great selection of wines from the winery. Details to be announced. Be sure to ask about the Draw that I will be offering clients this fall. A few days of luxury, decadence and adventure up at Nimmo Bay Resort during the summer of 2012 (go to www.nimmobay.com). This a picture of my new octopus sculpture shown as a work-in-progress (painted wax replica shown). I hope to have this piece back in bronze in time for the fall studio tour. The first Edition of 10 has been sold; additional editions are available by order. Other new sculptures underway include a pair of White Sided Dolphins Riding a Wave (macquette for a larger proposed installation) and several new local freshwater and marine fish. And then there is Bam Bam, the orangutang sculpture that will be the subject of my next entry.